The pointing pair technique can be used to eliminate number candidates from cells. It usually involves two cells but it can also involve three cells, which would be called a pointing triple. When you have a box and a certain number inside of that box has been limited to a single row or column, you can then eliminate that number from the rest of the row, column, or box. It gets its name from the concept that the pair or triple that you have found points the rest of the way eliminating that number in other places. 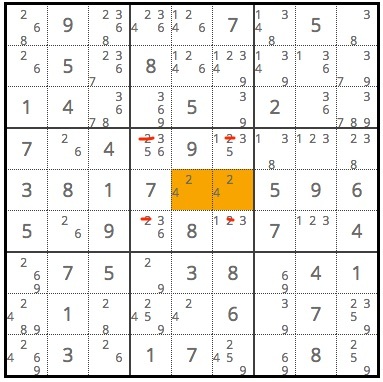 The orange boxes in the lower right box are the only cells in that box that can contain a 6. This makes a pointing pair that can be used to eliminate the 6s in the same column of the upper box. Pointing pairs can also be used to eliminate numbers from a box. If a pair or triple represents the last remaining spots for a specified number in a row or column and is contained in a box, then that number can be eliminated from the rest of the box. See example below. 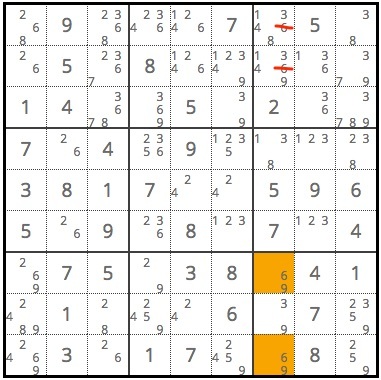 The orange squares represent the only two remaining spots of the middle row for the number 2. This makes a pointing pair and all the rest of the 2s in that box can be eliminated.